grissman: White Castle is leading the way by offering Impossible Sliders, there's no reason why McDonald's shouldn't offer a vegan burger as well. This will also expand the customer base for all those McDonald's customers with vegan friends. A fast food giant like McDonald's can enable customers in the US to eat healthier in a way that is less destructive to our planet while also saving millions of animals being bred and raised only to be killed. While pigs in nature live for about 15 years, on factory farms these gentle animals are selectively bred to grow extremely fast, reaching slaughter size in just six months. 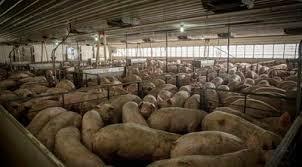 Sows on factory farms are constantly bred and confined to small, filthy cages. They are killed after only 3–5 years because their bodies can’t handle constant breeding. The natural lifespan of cattle is about 15–20 years, but due to selective breeding, cattle on factory farms are killed at only 18 months. Please add a healthy, plant-based item to the menu in the United States like you have in Finland.